Here’s a shot from the Eastern Sierra Death Valley Experience Workshop that I lead last month in March. There wasn’t much for clouds that morning Mono Lake just a few on the horizon so I used a mid range lens to fill the frame with what I found interesting. It was a weekday but there was still quite a few people on the shoreline so we were mainly shooting into the water to avoid the crowd. Some people might consider a lack of clouds or shooting crowded place a bad idea but you can always make something out of it and have a great time while photographing. You might be surprised at many landscape photographers need clouds or will not take a shot. I’ve seen some throw fits, throw things and curse at the sky. Being from Southern California, I do not mind it one bit and am very used to it. You don’t need the sky, you can just minimize interesting subjects in the scene you are photographing. It’s best to take advantage of time out there and excercise your eye. In the shot here the colorful band on the horizon is interesting but it merely just background decoration. During post processing I desaturated the cyans along with a few other color during the process to match my taste. This kept the color managed to avoid a garished look and feel. I also had to make adjustments for the polarization in certain parts of the image. It’s a single exposure since there was enough information on the histogram. This entry was posted on April 12, 2011 at 11:23 am and is filed under Uncategorized. You can follow any responses to this entry through the RSS 2.0 feed. You can leave a response, or trackback from your own site. Maybe being in SoCal really does make us a little more zen about cloudless skies–although I do find the mental image of enraged photographers, Lear-like, shaking their fist at the (cloudless) sky. Your post is a good perspective keeper; there have been several times where I’ve gone out and been SO disappointed with a cloudless sky, only to spend time with the resulting images and realize the clouds weren’t necessary to come away with something compelling. I’ve had clouds and no clouds at Mono, but my favorite set of photographs came from a crystal-clear afternoon and sunset this past winter. I was very fortunate to be there on a windless day, and the clarity and reflections were beautiful to behold. When I was first starting out I’d be like that too and would time everything based on when the clouds were there but eventually how stupid that was to just sit at home due to a clear sky. Another way to look at it is if you need clouds just to make an image then maybe it’s time to re-evaluate your photography. Great image Steve (and I don’t miss the clouds a bit). Just as there’s no such thing as “bad light”, a cloudless sky is an opportunity to adjust your vision and see the scene in a slightly different way. Thank you Robin, if a photographer begins to compose scenes easily with out clouds imagine how much better off compositionally the photographer will be. Richard, it’s the times when the clouds don’t line up with the interesting parts of land that bring that eureka moment. The clouds are mostly secondary subjects, but I do think some landscape photographers have an addictiction to these colorful clouds. That’s just a guess of mine. Russ, Thanks. I think for those willing to make adjustments their photography will improve everytime. Great shot wish I could have been there. Hey, here I found you again. I know and admire you from Flickr. Living in Washington on the Olympic Peninsula, I had to chuckle about “no clouds”. 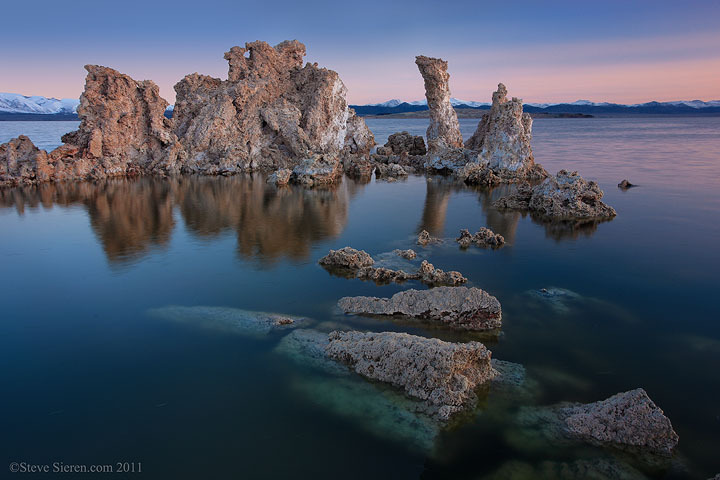 We love to paddle on Mono Lake. Klaus, it’s all in what you make out of what you’re given. I haven’t paddled out on the lake yet but sure hope o sometime soon.